As outlined in Chapter 7, previous research has suggested that caregivers have significantly greater mental health problems, depression and anxiety. In the Families Caring for a Person with a Disability study, we asked two sets of questions about mental health. Firstly, carers were asked a set of standardised questions about their mental health and their vitality in the last 4 weeks. People who had scores below 56 on the mental health scale have been found to satisfy the clinical diagnostic criteria for depression and related disorders (Berwick et al., 1991). We used this cut-off as an indicator of clinical levels of depression over the 4-week period, as we did not employ a standardised diagnostic interview (see Chapter 3 for details). The same questions were also asked in the Household, Income and Labour Dynamics in Australia survey. Consequently, comparisons of mental health and vitality can be made between carers in the FCPDS and those in the general population who do not have caring responsibilities for a person with a disability. These comparisons enable an understanding of how carers are faring compared to the rest of the population. The second set of questions asked whether the carer or other household members had ever been depressed or sad (even if they felt OK sometimes) for 6 months or more (a "depressive episode"). Carers were also asked in what year(s) the depressive episode occurred and for how long (one year, a period of consecutive years, or multiple non-consecutive years). The format of these questions enabled the timing of depressive episodes since the family started caring to be estimated. Again, we did not employ a standard diagnostic interview. 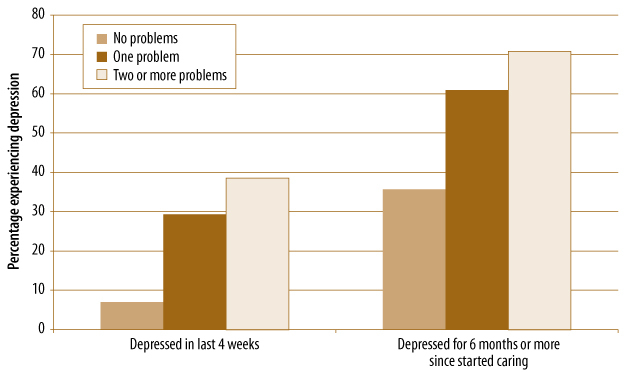 However, if respondents answered "yes" to whether they had ever been depressed or sad (even if they felt OK sometimes) for 6 months or more, it provided an indication of clinical levels of depression - a key criteria for major depressive disorder is a depressed mood for most of the day for more than a 2-week period. The question is also derived from the Kemper three-item screening measure for depression, which has been found to be a valid indicator of clinical levels of depression in nationally representative samples (Kemper & Babonis, 1992; Lanzi et al., 1999). 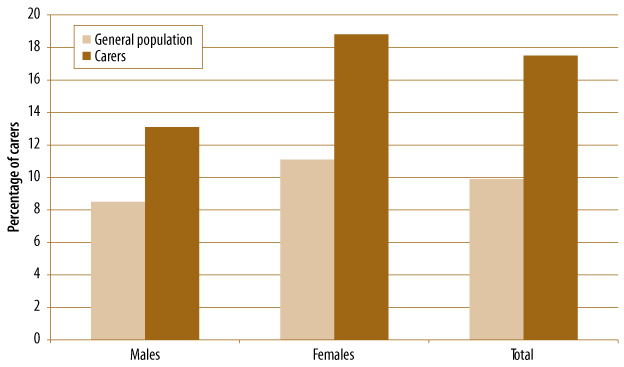 Figure 8.2 indicates that male and female carers had significantly worse mental health than males from the general population and female carers also had significantly worse mental health than females from the general population. In the FCPDS, female carers also had significantly lower levels of mental health compared to male carers. 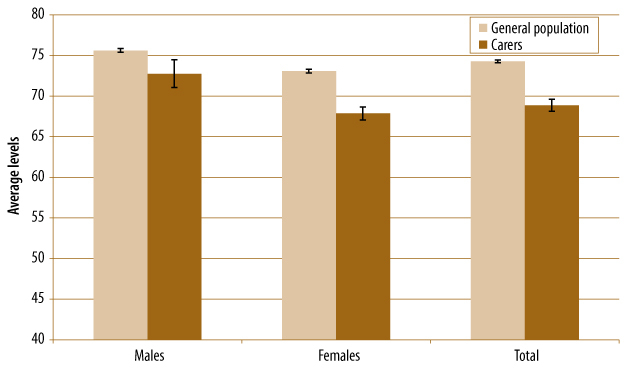 Although this finding mirrored the gender difference in the general population, where females had worse mental health than males, the gender difference in mental health scores was greater for carers (4.9) than it was for the general population (2.5). The size of the gender difference in mental health scores for carers was twice that of the general population, suggesting that caring affects females' mental health more than males, even after accounting for the size of the gender difference in the general population. These results are consistent with previous research. For instance, a meta-analysis of gender differences in the normal population indicated that there was a greater difference between female and male caregivers with respect to depression than there were with males and females who did not care for a person with a disability (Pinquart & Sorenson, 2006). 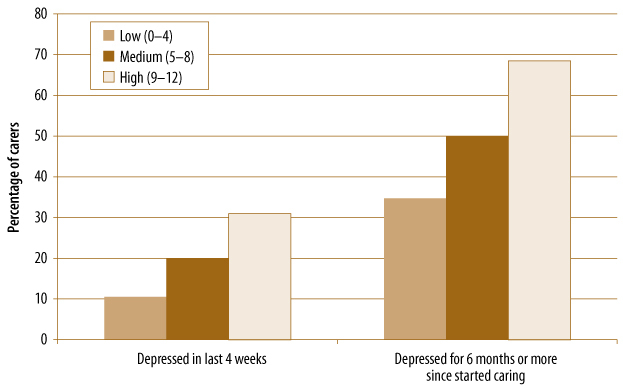 Figure 8.3 displays the incidence of clinical levels of depression in the last 4 weeks for male and female carers compared to the general population. The incidence of clinical levels of depression in the last 4 weeks was also significantly higher for male and female carers than male and females with no caring responsibilities. Thirteen per cent of male carers and 18.8% of female carers were at risk of having clinical levels of depression in the last 4 weeks. Notes: The incidence of clinical levels of depression in the past 4 weeks was also significantly higher for male and female carers than males and females with no caring responsibilities (males: χ2 (1) = 5.84, p < .05; females: χ2 (1) = 39.18, p < .001). As described at the beginning of this chapter, we also asked carers whether they had been depressed for 6 months or more since they started caring for a person with a disability. 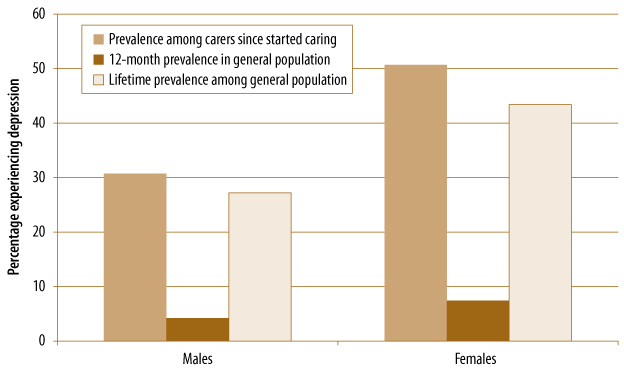 Figure 8.4 indicates that 50.7% of female carers and 30.7% of male carers reported that they had been depressed for 6 months or more since they started caring. We used information on the 12-month and lifetime estimates of the prevalence of depression in the Australian population from the 1997 National Survey of Mental Health and Wellbeing as a reference point for the incidence rates of depression illustrated in Figure 8.4.75 The 1997 National Survey of Mental Health and Wellbeing asked people about their depression in the last 4 weeks and these results were extrapolated to create 12-month and lifetime estimates of depression. Figure 8.4 suggests that the 12-month incidence of depression that was reported by both male and female carers is greater than the lifetime prevalence of depression in Australia. Moreover, the incidence of carers' depression (again, for both sexes) is seven times higher than the 12-month prevalence rate in the general population. There are several caveats that one should be aware of when making comparisons between incidence of depression among carers and national incidence rates of depression. Firstly, the question that was asked of carers about their level of depression in the last 6 months was not equivalent to the series of questions in the 1997 National Survey of Mental Health and Wellbeing. The 1997 National Survey of Mental Health and Wellbeing employed a diagnostic interview that complied with standardised diagnostic criteria used to diagnose someone with a major depressive disorder. Second, when people are asked to retrospectively recall their mental health status, inaccuracies can be introduced. However, studies that have examined recall biases have found that it is likely that people tend to fail to recall previous depressive episodes rather than provide overestimates (Patten, 2003). Moreover, 74% of carers in our sample have been caring for 10 years or less, making their estimates less likely to be open to recall bias. The much higher incidence rates of carers' depression over a 4-week period, when compared to a large general population sample obtained using the Mental Health Inventory, also support the high rates of depression over the longer 6-month period. Consequently, we believe that high rates of depressive episodes experienced over the 6-month period are not artefacts of the study design, but are fairly good estimates of carers' experience of depression. 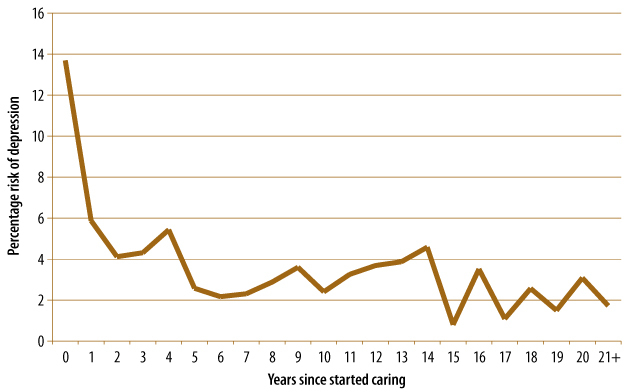 Figure 8.5 illustrates the risk of a first depressive episode, taking into account the fewer carers in each subsequent year, and those who had separated in a previous year.76 The most striking feature of Figure 8.5 is that the greatest risk appears to be at year 0, the first year of caring. After year 0, the risk of a first depressive episode is fairly constant, ranging between 2.0% to 5.0% for much of the next 20 years. The average risk over this 20-year period is around 3.0%. The most obvious implication of the findings in Figure 8.5 is that the first year of caring (year 0) is the time that any early intervention or support services that address mental health issues should be targeted.77 Thereafter, a less intensive but easily accessible intervention would be more appropriate. Although the average risk of a depressive episode over the next 20 years is only around 3.0% per annum, the cumulative effect of this risk is significant. In this chapter, we have already illustrated that female carers are at greater risk of depression and worse mental health than male carers. In this section, we focus on a few key demographic and caregiving variables and see how they relate to the mental health and vitality of carers. It has been projected that Australia's population will grow over the next 40 years, but with a higher proportion of older people (Treasury, 2007). 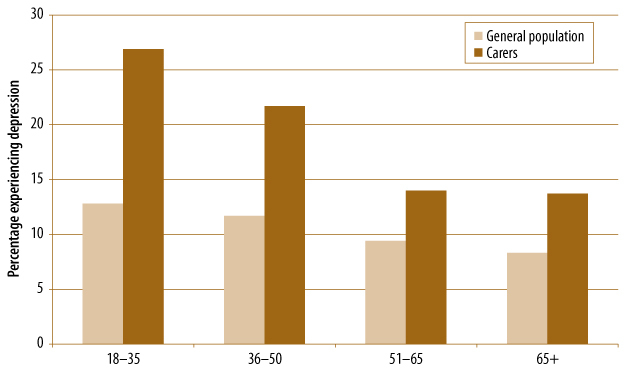 Consequently, a policy concern is that a greater proportion of carers will also be older (AIHW, 2004). Male carers were not included in these analyses because the number of male carers in some age categories was too small to provide reliable comparisons. 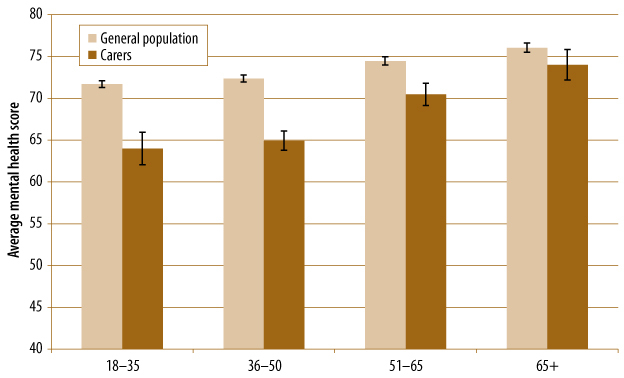 Figures 8.6 compares the average mental health scores of female carers of different ages with females from the general population for each age group. Female carers had better mental health in each successive age group, and a similar trend can be seen for females from the general population. The mental health gap closed with increasing age; the largest differences were observed between female carers and females from the general population aged 18 to 35 years, but there was no significant difference in levels of mental health for those aged 65 years old or greater. A similar pattern could be observed when comparing the vitality of female carers to females in the general population. 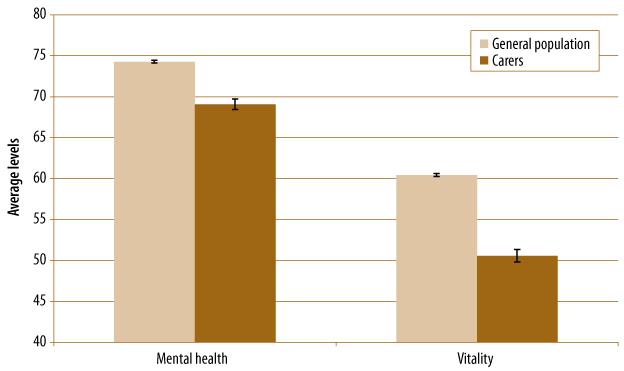 Female carers in the two younger age cohorts (18-35 and 36-50 years) had significantly worse vitality scores than females in the general population (see Figure 8.7). The gap between carers and the general population is smaller in the next age cohort (51-65 years), with female carers having very similar vitality scores to females in the general population and, interestingly, in the oldest group (65 years or more), carers actually had better vitality. 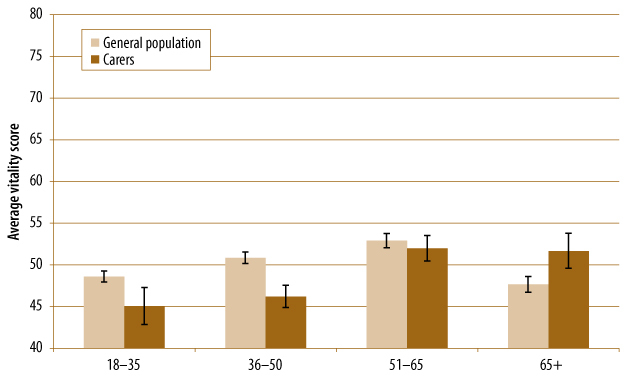 Figure 8.8 compares the incidence of clinical levels of depression for female carers and females from the general population who do not care for a person with a disability. The general pattern is the same as for Figures 8.6 and 8.7. The first point to note is that the incidence of clinical levels of depression declines as female carers and females from the general population age. More importantly, Figure 8.8 suggests that the difference in the incidence of clinical levels of depression is highest when carers are younger (26.9% of carers aged 18-35 years are at risk of clinical levels of depression, compared to 12.8% of 18-35 year old female non-carers), and declines markedly from the age of 50 onwards. Caring for a child with a disability may be particularly challenging (see Chapter 5). Almost one in three carers in the FCPDS (34.7%) cared for a person with a disability who was under 18 years of age. We investigated whether caring for a child with a disability was more stressful than caring for an adult. 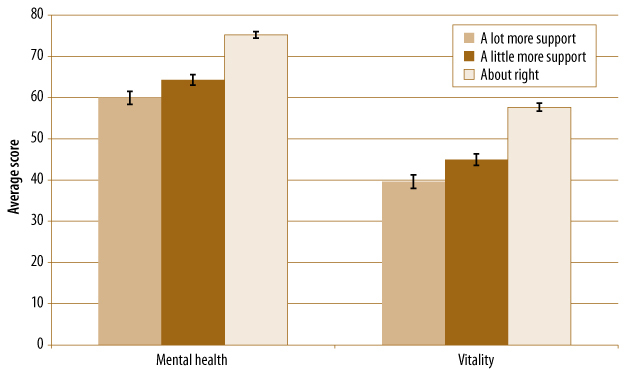 Figure 8.9 suggests that carers who cared for at least one child with a disability had significantly lower levels of mental health and vitality than carers who did not. 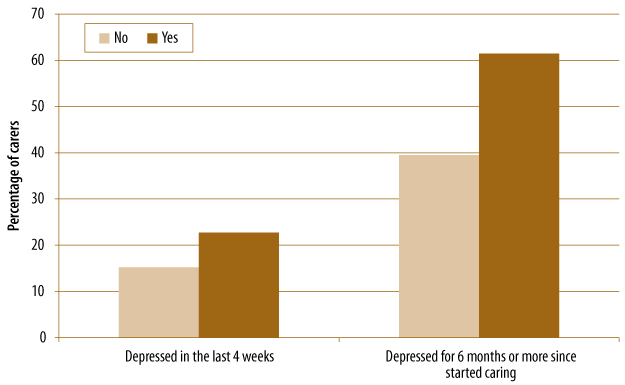 Carers who cared for a child with a disability also had a significantly higher incidence of depression in the last 4 weeks and reported higher rates of depression when asked whether they had experienced depression for 6 months or more since they started caring (Figure 8.10). 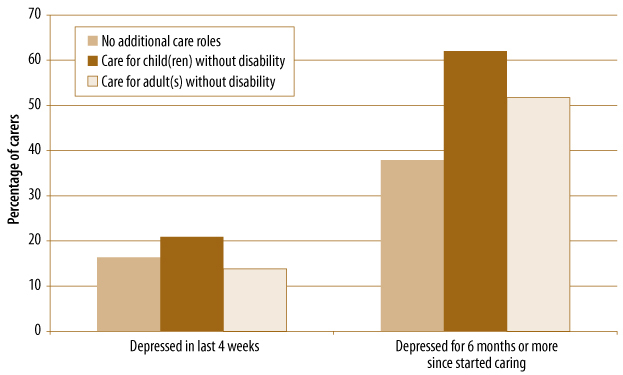 As can be seen from the figure, the difference in the incidence of depression between carers of adults with a disability and carers of children with a disability was not as marked when depression was measured for the last 4 weeks (15.2% versus 22.7%), compared to when carers had experienced depression for 6 months or more since caring started (39.5% versus 61.4%). The reasons for these results may be myriad, and a more detailed study is required to fully understand the factors behind the higher rates of mental health problems in carers of children with a disability. However, they do underscore that caring for a child with a disability is particularly stressful. Notes: Carers who cared for a child with a disability also had significantly higher incidences of depression in the last 4 weeks (χ2 (1) = 8.12, p < .01) and reported higher rates of depression when asked whether they had experienced depression for 6 months or more since they started caring (χ2 (1) = 40.15, p < .001). A variety of studies have suggested that high care needs of the person with a disability is associated with lower energy levels and worse mental health for carers (Pinquart & Sorensen, 2004). The influence of the care needs of the person with a disability78 on carers' mental health and vitality are illustrated in Figure 8.11. Carers of people with low care needs have significantly better mental health and more vitality than carers of people who have medium or high care needs. Moreover, carers of people with medium care needs also have significantly better mental health and vitality than carers of people with high care needs. A similar pattern was evident with respect to the incidence of carers' depression in the last 4 weeks and for 6 months or more since they started caring (Figure 8.12). Carers who cared for people with more care needs had significantly higher incidences of depression when assessed for the last 4 weeks and for 6 months or more since caring started. For example, carers of a person with a disability with high care needs had three times the rate of clinical levels of depression (30.9% compared to 10.5%) when measured over the last 4 weeks and almost twice the rate for 6 months or more since caring started than those caring for a person with low care needs (68.9% compared to 34.8%). Notes: Carers who cared for people with more care needs had significantly higher incidences of depression at 4 weeks (χ2 (2) = 36.79, p < .001) and for 6 months or more since caring started (χ2 (2) = 59.84, p < .001). One hundred and twenty-six carers (12.6% of the sample) cared for two or more people with a disability. Caring for multiple persons with a disability has particular challenges, including the potential for an increased amount of care being required, as well as needing to cater to a broader variety of care needs. With these issues in mind, we investigated differences in mental health and vitality for those who were caring for a single person or multiple people with a disability. As there were too few carers who cared for three or more people with a disability to derive reliable results (n = 12; 1.2% of the sample), our analysis focused on differences between carers of one person or two people with a disability. 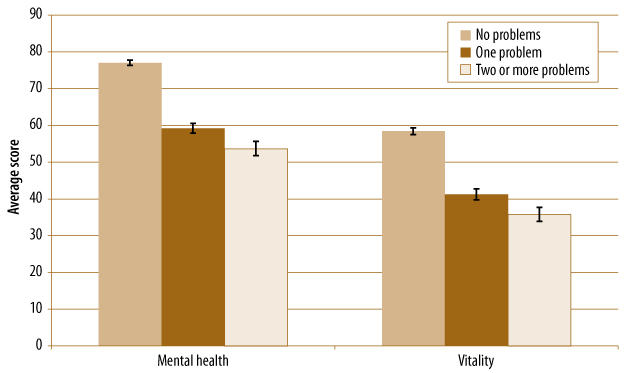 Figure 8.13 suggests that carers who cared for two people with a disability had significantly worse mental health and vitality than carers who cared for one person. 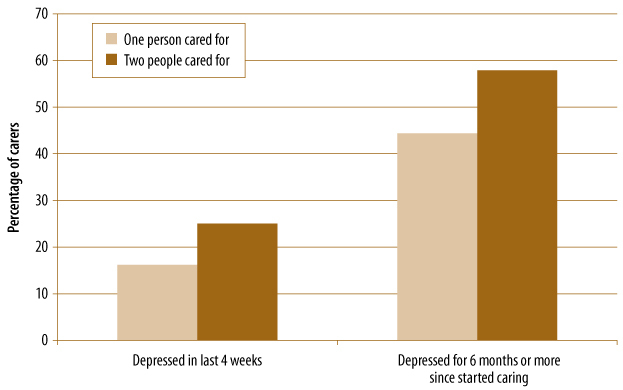 The incidence of carers' depression in the last 4 weeks and for 6 months or more since they started caring was also greater for carers of two people with a disability than for carers of one person (see Figure 8.14). In addition to the role they play in caring for a person with a disability, carers also may have other care roles. In the FCPDS, 31.9% of carers were caring for at least one child without a disability and 2.5% were caring for parents who did not have a disabling condition. Role overload is one factor that has been associated with carers' mental health (Murphy, 2000). 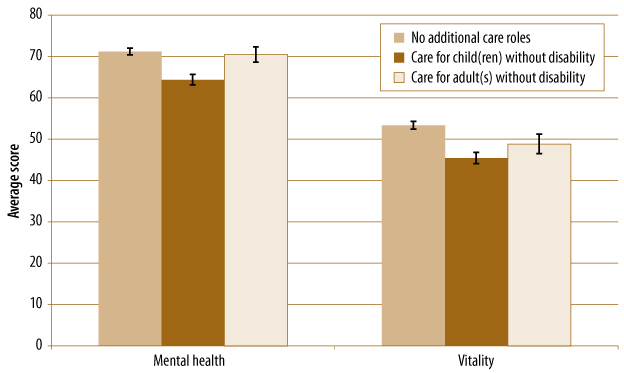 Figure 8.15 displays the average mental health and vitality scores of carers who have no additional care roles, care for a child without a disability or care for a parent without a disability. Carers who care for a child (or children) have significantly worse mental health than carers who care for a parent or have no additional care roles. The vitality of carers who care for a child (or children) was also significantly worse than carers who had no additional care roles (but not significantly different from the vitality of those caring for an adult with a disability). The incidence of depression in the last 4 weeks, as well as for 6 months or more since carers started caring was also highest for carers who cared for a child (or children), compared to both carers who cared for a parent and carers with no additional care roles (see Figure 8.16). These results are consistent with Cummins and colleagues (2007), who reported that carers with children had the highest levels of stress and greater levels of depression than carers who were living alone or with their partner. These results, when taken together with the increased rates of mental health problems of carers caring for a child with a disability, suggest that carers who have dependent children are at particular risk of mental health problems. Family functioning has been associated with carers' and their families' mental health (e.g., Edwards & Clarke, 2004, 2005). Less is known about the influence of family functioning on carers' vitality or energy levels. Based on the literature and conceptual models reviewed in Chapter 5, it was expected that families with better family functioning would provide more support for the carer, and hence carers would be expected to have more vitality in families with higher levels of family functioning. As described in more detail in Chapter 3, carers were asked to indicate whether they agreed or disagreed with five questions assessing family functioning. These questions assessed family cohesion, tension, communication, flexibility and resilience. We defined having a problem in family functioning as being when carers indicated that their family had an issue in one of the dimensions of family functioning. For instance, if the carer disagreed or strongly disagreed with the statement "We talk about our personal problems and help each other deal with them", this was considered to indicate a problem with communication. 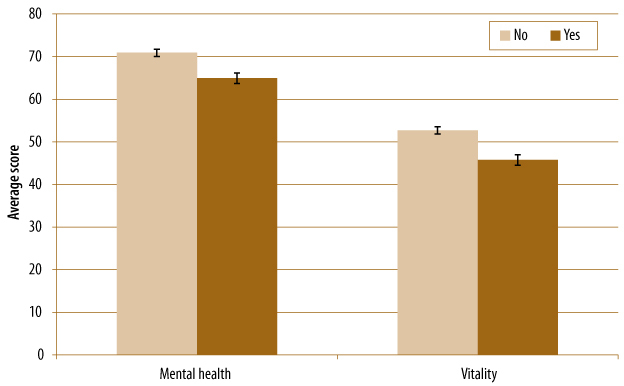 Figure 8.17 displays the average scores on mental health and vitality for carers who indicated that there were no problems on any of the five dimensions of family functioning compared to carers who have indicated they had one, or two or more problems. Carers who indicated their family had no problems in family functioning had significantly better mental health and vitality than the other two groups. Carers who indicated that their families had two or more problems in the dimensions of family functioning in turn had significantly worse mental health and vitality than carers who indicated that their family had only one problem in family functioning. Although carers scores on vitality were worse than for mental health overall, the same pattern was evident for both outcome measures: a greater number of family problems were associated with poorer wellbeing. The incidence of carers' depression was also higher when carers indicated that their families had problems in one, or two or more dimensions of family functioning. Figure 8.18 suggests that carers who indicated they had one problem in a dimension of family functioning had four times the incidence of depression in the last 4 weeks than carers with no problems in family functioning (29.3% versus 7.0%). Carers who had two or more problems in family functioning had five times the incidence of depression than carers who had no problems in family functioning (38.5% versus 7.0%). A similar pattern can be observed when carers reported being depressed for 6 months or more since they started caring (see Figure 8.18). These results underscore the robust association that has been observed in other Australian and international studies between mental health and family functioning (e.g., Edwards & Clarke, 2004). As has been documented in Chapter 5, extensive information was collected about the types of support received by the carer and by the person with a disability. The availability of support people has been found to be associated with carers' mental health and energy levels in other studies (Pinquart & Sorensen, 2007). Figure 8.19 shows the average mental health scores for carers by the number of support people engaged in four types of supportive behaviours. Carers who had no support people to help with everyday duties had significantly lower levels of mental health than carers who had one, two, or three or more support people. Carers who had three or more people to help with everyday duties also had significantly higher levels of mental health than carers in each of the other three groups. When the person with a disability had three or more people (excluding the carer) to assist with self-care, mobility and communication, their primary carers' mental health was significantly better than when there were 0 to 2 support people. 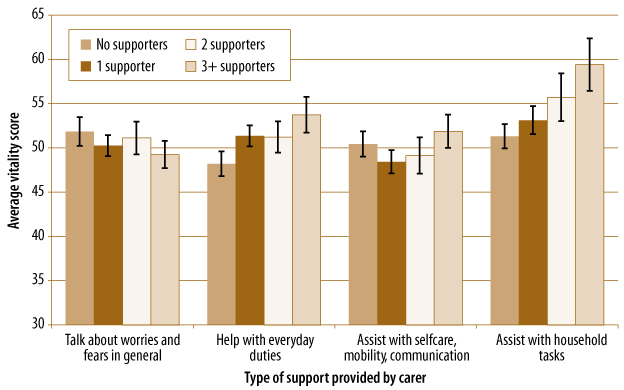 Carers had significantly better mental health when three or more support people (in addition to the carer) could provide assistance to the person with a disability with household tasks than when there were 0 to 2 people providing assistance in this area. When two people were providing assistance to the person with a disability with household tasks, carers' mental health levels were significantly higher than when there were no support people in this area. 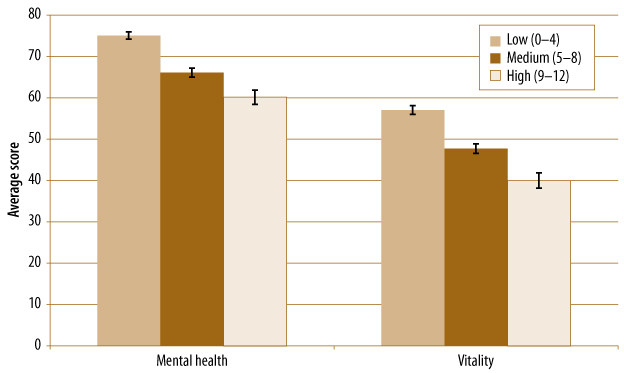 Fewer differences in carers' levels of vitality were evident when the numbers of people providing various supportive behaviours were considered (see Figure 8.20). Carers with no people or one person to assist with everyday household tasks had significantly worse vitality than when there were three or more people providing this type of assistance. Moreover, when carers had no person to help with everyday duties, the carers had significantly lower vitality than those who had the assistance of one or more people in this area. As with mental health, the number of people available to talk to about worries and fears, and assist the person with a disability with self-care, mobility and communication was not associated with carers' vitality. The incidence of clinical levels of depression in the last 4 weeks had some associations with the number of people providing particular types of support (Figure 8.21). There was an association between the number of people providing help with everyday duties and the incidence of clinical levels of depression in the last 4 weeks. For example, 22.0% of carers who had no people providing help with everyday duties had clinical levels of depression, compared to 12.1% of carers who had the support of three or more people in this area. There was an even stronger association between the number of people providing assistance to the person with a disability with household tasks and the incidence of carer depression; when no-one else assisted the person with a disability with household tasks, 18.8% of carers had clinical levels of depression, compared to 3.0% when three or more people assisted the person with a disability in this area. It appears from this data that lack of availability of supports for carers and the person with a disability is associated with a 6-fold increase in the risk of developing clinical levels of depression. Notes: There was an association between the number of people providing help with everyday duties and the incidence of clinical levels of depression in the last 4 weeks (χ2 (3) = 9.00, p < .05). There was an even stronger association between the number of people providing assistance to the person with a disability with household tasks and the incidence of carer depression (χ2 (3) = 11.15, p < .05). Perceptions of support have been found to have even stronger associations with carers' mental health and vitality than the number of support people (e.g. Roth, Mittelman, Clay, Madan, & Haley, 2005). 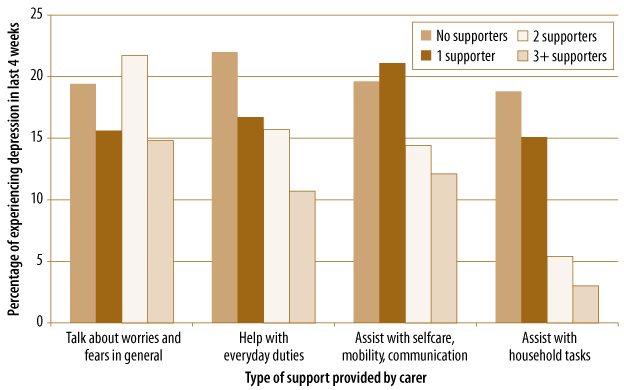 In the FCPDS, we asked carers whether they received the support they needed. 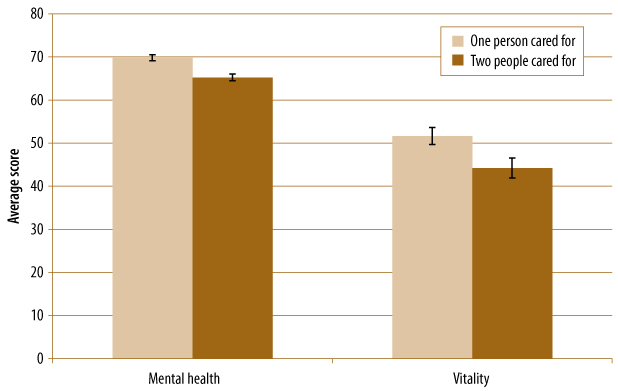 The association between carers' mental health and vitality and the need for more support is demonstrated in Figure 8.22. There is a clear and consistent pattern, with carers who indicated that the support they received was "about right" having significantly better mental health and vitality than carers who needed a lot or a little more support. 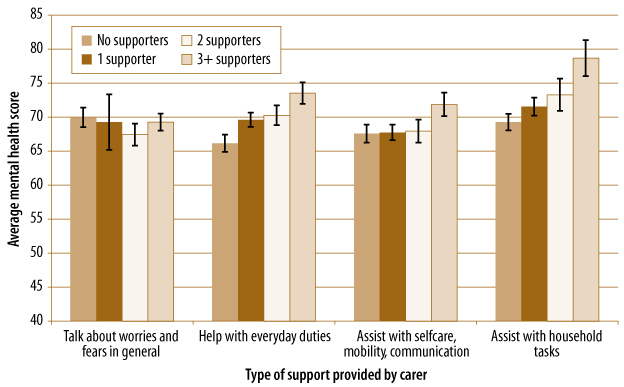 Carers who said they needed a lot more support also had worse mental health and vitality than carers who indicated they needed a little more support (although the difference was small, it was still statistically significant). Carers' perceptions of support were also associated with the incidence of depression in the last 4 weeks and the frequency of reporting they had been depressed or sad for 6 months or more since they had started caring. 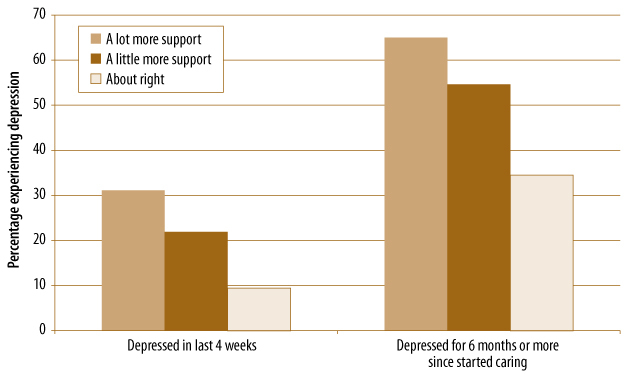 Compared to carers who thought the support they received was about right (9.4%), carers who needed a little more support had twice the rate of depression in the last 4 weeks (21.9%), and carers who needed a lot more support had three times the rate (31.1%; see Figure 8.23). A similar pattern can be observed with carers reporting they had been depressed for 6 months or more since they started caring. Carers who needed a little more support had an incidence rate 1.58 times that of carers who said the support they received was about right (54.6% versus 34.5%). Moreover, carers who needed a lot more support had an incidence rate 1.88 times that of carers who indicated the support they received was about right (65.0% versus 34.5%). Notes: Carers' perceptions of support were also associated with the incidence of their depression in the last 4 weeks (χ2 (2) = 51.69, p < .001) and the frequency of reporting that they had been depressed or sad for 6 months or more since they had started caring (χ2 (2) = 64.90, p < .001). Mental health problems in a household are often not isolated to one family member, as multiple family members may experience mental health problems (Edwards & Clarke, 2004). There are several possible explanations that have been proposed for this phenomenon, including a shared genetic susceptibility or the experience of similar environmental stressors. In the context of caring for a person with a disability, several characteristics of caring were associated with carers' mental health, and exposure to these factors is shared by household members. The experience of depression or mental health problems in one individual family member has previously been associated with other family members' depression and anxiety, and could be a risk factor for carers. The influence of other household members' mental health problems on the mental health of the carer is illustrated in Figure 8.24. When there are other household members who have experienced depression for a period of 6 months or more, the incidence rate of carers experiencing depression in the last 4 weeks as well as for 6 months or more is higher. 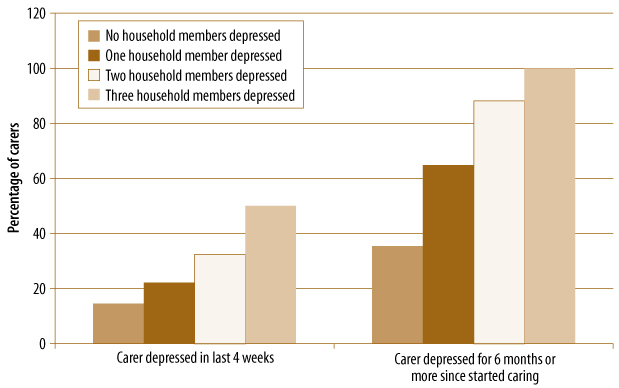 For example, when two household members had been depressed for 6 months or more, 32.4% of carers reported they had been depressed in the last 4 weeks, whereas only 14.5% of carers were depressed in the last 4 weeks when no other household members had been depressed. Similar patterns were also evident for carers' experience of depression for 6 months or more since caring, with 35.4% of carers reporting depression for 6 months or more when no other family member had the same experience and 88.2% of carers reporting depression when two family members had also reported depression for 6 months or more since they started caring. Notes: The associations do not account for the number of household members in the household, nor do they provide information about whether the depression of a particular family member in the household has a particular impact on carers' depression. Future analyses will be able to explore this issue in more detail. The data from this chapter suggest that carers have significantly worse mental health, worse vitality and higher rates of depression than the general population. Differences on these variables were evident for carers of all age groups, except when carers were 65 years or older. Fifty-one percent of female carers and 30.7% of male carers reported that they had been depressed for 6 months or more since they started caring. The 12-month incidence of depression reported by carers of both sexes was greater than the lifetime prevalence of depression in Australia. The risk of carers experiencing a first depressive episode of at least a 6-month duration was greatest in the first year of caring (over 13% of carers), and over the next 20 years was fairly stable at about 3%. In this context, early intensive interventions and supports are important in the first year of caring and thereafter a less intensive, but easily accessible, intervention would be more appropriate. other family members had experienced a period of 6 months or more of depression. 74. Comparisons were based on calculating 95% confidence intervals from standard errors provided in Ware et al. (2002). 75. The 1997 National Survey of Mental Health and Wellbeing collected information on the 12-month prevalence of depression in the Australian population and synthetic estimates were calculated for the lifetime prevalence of depression (Andrews et al., 1999; Kruijshaar et al., 2005). 76. This is often referred to as a "hazard rate". The hazard rate is expressed as the percentage of carers who have experienced a first depressive episode at a particular time point, divided by all the carers who have not previously experienced a depressive episode and are still caring at that time point. For example, at Year 1, 48 carers experienced their first depressive episode and 843 did not, creating a hazard rate of 5.4%. 77. It may be that part of the increased risk for a depressive episode in year 0 is due to a selection effect. In other words, carers who experienced a depressive episode in their first year of caring may not have continued caring and therefore would not have been part of the FCPDS sample. However, the evidence from the FCPDS sample does not support such an argument. 78. As 120 carers were caring for two or three people with a disability, the highest level of care needs reported for any one of the people of the disability is used.